My camera body and lenses are heavy as it is, so when it comes down to what else I pack in my camera bag, I keep it limited and compact. Remember when preparing your bag, a typical wedding day requires you to be on your feet for at least 8 hours and your body is going to need to bear the weight. I certainly learnt quickly what the necessities were. 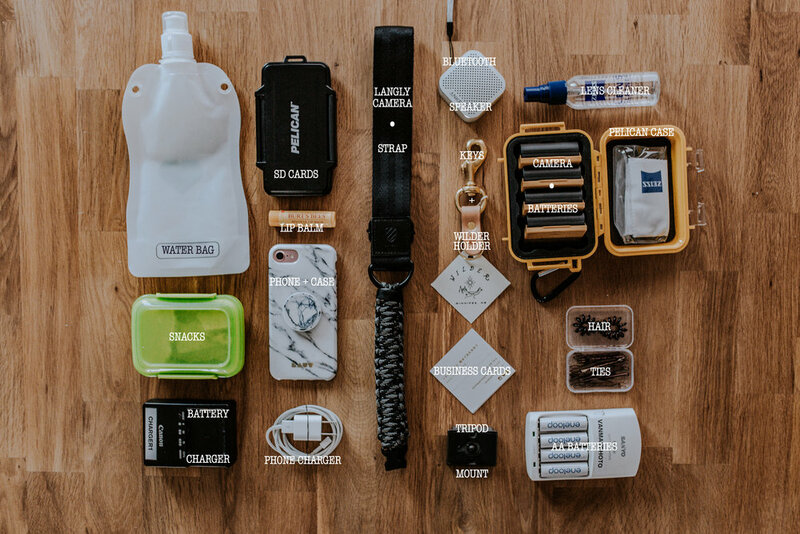 Below is a photo of what I usually carry around with me for a shoot or on a wedding day. Water Bag- This actually clips onto the back of my camera bag so it doesn't take up any space inside. I can't provide a link to this as it was a Montreal travel token but I'm sure you can find these online or at a souvenir shop. Pelican Cases- I protect all of my cards and batteries with water proof Pelican Cases. SD CASE. BATTERY CASE. Tripod Mount- I've included this because this piece is almost always attached to my camera body. Otherwise, it is with my tripod that I keep in the trunk of my car. Lens Cleaner- I recommend carrying a lens cleaning kit in your camera bag at all times. Bluetooth Speaker- I ended up finding this mini Bluetooth speaker on sale for $10.00 CA. For that price tag, I was shocked at how high the volume goes. It has a string to attach to the side of my camera bag. Music has been a wonderful tool for breaking down any ice. Hair Accessories- Not only are these useful for you, but you'll run into many people that can use a bobby pin throughout the day. Business Cards- Pass them out!